Yes still catching up on AARs! This fortnight we revisited Sixty-One Sixty-Five again, that's three sessions in a row! 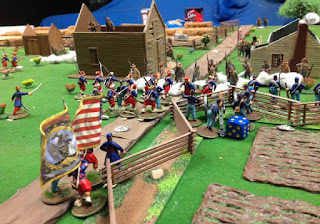 Its the 2nd scenario in the rules and has the CSA on the attack. Everything started well for the Confederates rapidly advancing and occupying the buildings while the Federal units advanced slowly. Turn 2 and first blood went to the Yankees but this did not stop the Southerners rushing forward! Meanwhile the Yankees were hanging out for their artillery to deploy (in fact it only deployed on turn 8, the last turn we played!). Lacking their artillery and already desperate the Federals went over to the attack! They pushed troops forward on both flanks engaging the Rebels and successfully slowed them down. Firing along the entire line continued to inflict casualties on both sides. Soldiers fell at a steady rate on both sides and that favoured the Confederates with their stronger force. 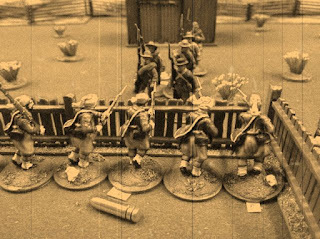 The Federal skirmishers now surged forward and worked hard shaking several Southerners. This weakened a couple of Squads and charges were launched against them which looked promising but were well held! The Union troops were now fully engaged and over extended so the Confederates deployed to advance again. At this point the Federal artillery arrived and then...we ran out of time so called it a night... DOH! Overview after turn 2 with the Federals to the left. The Rebel are advancing rapidly and their skirmishers have already occupy all 3 buildings! Turn 8 and finally the Federals artillery has arrived...and we ran out of time...DOH!